Play for young children is not recreation activity,… It is not leisure-time activity nor escape activity…. 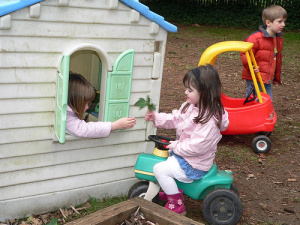 Play is thinking time for young children. It is language time. Problem-solving time. It is memory time, planning time, investigating time. It is organization-of-ideas time, when the young child uses his mind and body and his social skills and all his powers in response to the stimuli he has met. © 2019 BC Crossroads Preschool. Website Designed and Created by Mocha Design Studio.